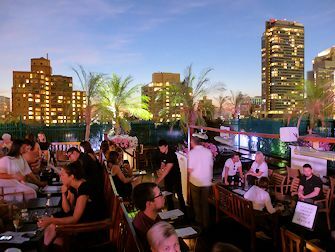 The rooftop bar tour in New York offers an opportunity to discover some of Manhattan’s best rooftop bars at a reasonable cost.Most noteworthy, you will see breathtaking city views that only get better as you enjoy your drink, amongst local New Yorkers. There are many advantages of Booking the rooftop bar tour: The host ensures you don’t have to wait in line! In addition, you don’t risk being refused at the door and aren’t obliged to order expensive drinks. 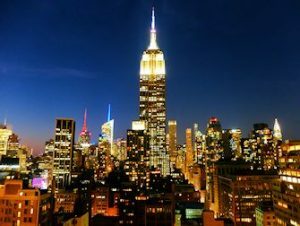 It is, therefore, the easiest way to enjoy a fun night out in New York! 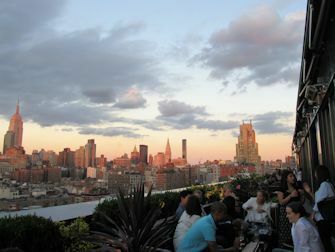 I highly recommend this tour if you want to discover New Yorks’ hippest rooftop bars. The tour takes you three rooftop bars in three hours. In addition, the price includes all transportation between bars. There are also three complimentary drinks included. Although each tour is different, it always includes genuine Manhattan hotspots. The tour is available on Tuesdays, Thursdays, Fridays and Saturdays and starts at 19:00. So, if you are here between April and October, you can enjoy the sunset over Manhattan. This tour is a nice thing to do all year round, even in the winter. Many bars have heaters outside and there’s always an indoor area too. This tour takes you to multiple locations. Rooftop bars are so popular that, especially at the weekend, it’s difficult to get in when you go alone. Don’t expect a ‘tour’ in the classical sense of the word, where the host explains things and gives facts, but a fun night out for yourself. The benefit of this tour? At the various bars, you get to skip the long queues. Three drinks are also included, that otherwise would be expensive, they can sometimes be served in plastic cups, for safety reasons. The tour operator will choose from a number of rooftop bars, and check before each evening what the best locations are to visit that day. All rooftop bars are in or have a view of Manhattan. Occasionally there is a private event in one of the bars, so not all the space is accessible to the tour group. In some locations, it is possible that only the inside area is accessible. After you arrive in the last bar of the tour, the host will leave. You are free to stay though, for as long as you like, and enjoy a real New York night out. The number of participants on this tour varies per evening but the maximum is 40. The group is often international. Alongside English, the host speaks another languages. In many of the bars there is a dress code, so be sure to dress up for this tour. Eric’s Tip: I have been on this tour several times and enjoyed it a lot! The tour might seem expensive, but it’s more than worth it. There are three drinks included, which would cost almost as much as the tour itself (rooftop bars in New York are expensive, so don’t be surprised to pay $15 for a cocktail and $10 for a beer). In addition, you get in to all the bars straight away: a huge bonus at these popular bars, where you would otherwise have to wait in line. Personally, I think this tour is most fun on a Friday or Saturday. After purchasing, you will receive a voucher with all the information. You don’t need to print the voucher. Duration: This tour has an open end, but concludes at the last venue. Please note there’s no transportation back to the meeting point. Departure time: 19:00, make sure you arrive 15 min before. Participation is not guaranteed if you arrive late. The operator will do their best to get you a spot. Please note: With this tour three drinks are included in the price. The host will give you the drink options, depending on what is available per bar (mixed drinks/ wine/ prosecco/ beer). If your drink of choice is not included, you can decide to order it separately, at full price. There will be no refunds if you do not choose to consume one of the drinks on offer. At some of the rooftop bars, use of the cloakroom is mandatory. The charges for this are not included in the tour price.